The Canadian Hockey League announced the 40 players that will compete in the 2018 Sherwin-Williams CHL/NHL Top Prospects Game at Sleeman Centre in Guelph on Thursday, January 25. 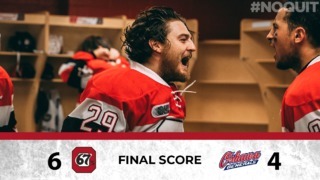 Included in the 40-player roster is 67’s defenceman Kevin Bahl and forward Kody Clark. Coming off and sound rookie season, the six-foot-six Bahl continues to strengthen his game in his second season with the Barber Poles. Under the tutelage of Head Coach Andre Tourigny and his staff, the 17-year-old’s development continues to flourish. Much like Bahl, Kody Clark is having a standout sophomore campaign with Ottawa. Through 27 games this season, Clark has already well surpassed his totals from his rookie campaign and isn’t far off being a point-per-game player. Team Cherry and Team Orr will be assigned at a later date with coaching staffs along with captains and alternates still to be announced. Click here for the complete 40-player roster selected. The 2018 Sherwin-Williams CHL/NHL Top Prospects Game will be broadcast live on Sportsnet and TVA Sports. 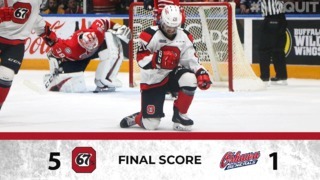 The 67’s return to action tonight in Peterborough before preparing for a historic afternoon at TD Place on Sunday when they renew their rivalry with the Gatineau Olympiques in the first-ever outdoor game in Barber Poles history. 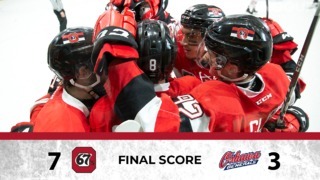 Tickets to Sunday’s 67’s Outdoor Game start at just $15 and are available at Ottawa67s.com.